KOLOLO – Onduparaka FC may not be the biggest side in the StarTimes Uganda Premier League but one which knows how things are done in the top tier. After ending their partnership with Betway earlier this season, the club looked destined for doom with info coming from Arua claiming that they were in a financial crisis of sorts. 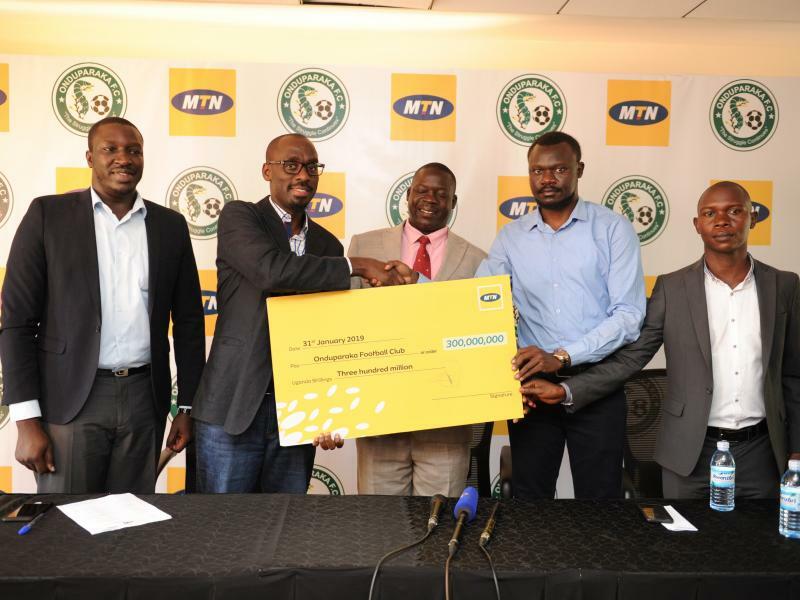 Four months down the road, Onduparaka have renewed their partnership with telecommunications giants MTN which will see the two parties remain in close tabs until at least 2020. This was confirmed on Thursday as the two parties signed a one year deal that will run from June 2019 to June 2020. The one-year understanding will see MTN invest a whopping 300 Million Shillings in the Arya based side. MTN Uganda have extended their business relationship with Uganda Premier League (UPL) club, Onduparaka FC, for yet another year. While unveiling the package before the media at MTN Uganda Offices, Kololo, MTN Senior Manager in charge of Brand and Communication, Mr Martin Sebuliba, revealed that it was an easy decision for the MTN to renew their partnership with Onduparaka FC, basing on the club’s fan base, consistency, and success in the Uganda Premier League. “We are thrilled to have renewed our sponsorship with Onduparaka FC, Sebuliba noted. “Onduparaka’s consistency, fan base, and success in the Uganda Premier League remain attractive for our sponsorship package. “It was an easy decision for us to renew the sponsorship, and become the merchandise sponsors for Onduparaka. The 300 million package shall see MTN covering Onduparaka’s training kits, home and away match kits, and others, as well as being the official merchandise sponsors of the club. Atiku Bernard, the Onduparaka FC’s patron, was typically excited about the success of their relationship with MTN. “Onduparaka has achieved tremendous success against all odds,” An excited Hon Atiku noted. “There were skeptics who thought that we would never become a giant, but we proved them wrong. “Today we take pride in ourselves as having the biggest sporting brand in the country, and aspiring to be one of the biggest in East Africa. Onduparaka have endured a relatively good start to the StarTimes Uganda Premier League so far, sitting in 5th on the table with 23 points from their first 15 games. Their next fixture will be away to Bright Stars on Saturday at the Champions Stadium in Matugga.